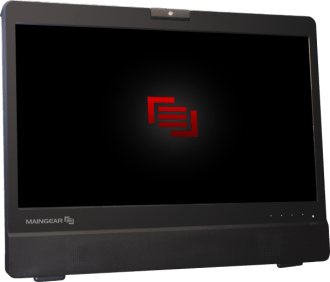 Maingear looks to put an end to hardware compromises that have traditionally come with all-in-one configurations. Their new Alpha 24 Super Stock offers desktop-level hardware in an AIO platform courtesy of Intel’s Thin-Mini ITX standard that's sure to appeal to gamers. The Alpha 24 Super Stock starts at $1,399 which includes a 24-inch 1080p LED backlit display, a Gigabyte Solo 24 H61 motherboard, Intel Core i3-3240 processor, 8GB of Corsair DDR3 memory, Nvidia GeForce GTX 650 GPU, a 1TB Seagate HDD, 8X Dual Layer Burner and an all-in-one card reader. Of course this wouldn’t be a true gaming platform without some upgrades here and there which is exactly what Maingear has in mind. Buyers can configure a system with up to a Core i7-3770K CPU clocked at 3.5GHz, 16GB of Corsair RAM, a GTX 680 graphics card, a Crucial 256GB mSATA SSD, a 2TB Seagate hard drive and a 6X Blu-ray Burner. With all of these extras, expect to pay around $2,750. It’s worth pointing out that you’re getting a full-sized desktop GPU here, not a watered-down notebook chip. This is the same form factor that Maingear is using in the Solo 21 AIO. This means that, just like the Solo 21, the 3.75-inch thick Alpha 24 Super Stock will be fully upgradable as new hardware becomes available. This is a key feature because like most notebooks, AIO’s aren’t exactly user-friendly when it comes to adding new hardware. Maingear is accepting pre-orders now and expects the first batch to ship out on October 10.